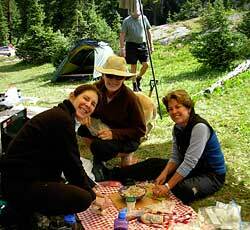 ••Paragon Guides recommends that all interested parties have some experience and a basic knowledge of backpacking. Our Llama Lease program is not a guided trip. We can assist you with area information but cannot be held accountable for lack of knowledge or decision-making. 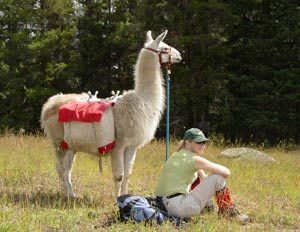 The Llamas offer much smaller backpacks for everyone, even a few camp luxuries, but do not make up for personal knowledge or camping experience. Even as seasoned “Llama Wranglers” our guides know that the Llamas will add another dimension to the adventure. First time Llama handlers are required to attend a 4 hour training to familiarize themselves with the skills needed to safely and effectively move through the backcountry with Llamas. We recommend that at least two members of the group attend the training. We also recommend scheduling the session at least two days prior to your trip. This gives you ample time to organize and sort out all of the gear that will be carried by the Llamas. The trainingwill cover saddling, loading and balancing panniers, knots, picketing, area impact, feed and browsing, and navigating obstacles. Cost for the training session is $100.00. For return clients and those people with Llama experience we highly recommend a shorter “brush-up” course for $50.00. How many Llamas do I need? Trailhead transportation of the Llamas – our fee for transportation is based on miles traveled to and from the trailhead (usually two round trips). Paved vs dirt/unimproved roads will be priced accordingly. 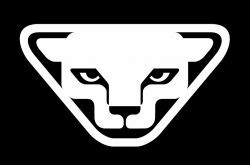 Each lease is custom designed. Contact us with your trip plan. Leasor is responsible for the care of llamas and responsible for any loss.